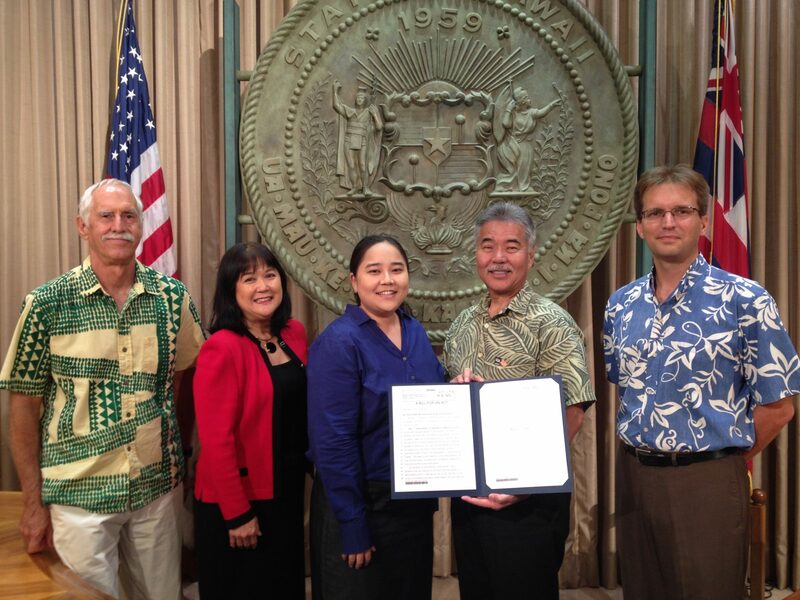 Learn more about Common Cause Hawaii's recent accomplishments. Since Common Cause Hawaii’s resurrection in 2008, we have been at the forefront of advocating for a stronger democracy. 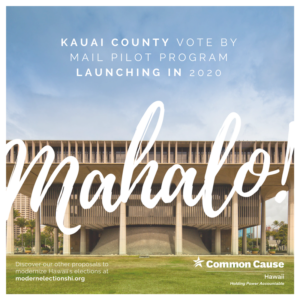 Kauai Vote By Mail Pilot program for 2020 (HB1401 2017). While we were advocating for a statewide VBM program, we are hopeful that this pilot program is just the first step. Mahalo to everyone who called, submitted testimony, and wrote letters to editor. Progress on this issue would not have happened without you. On June 25, 2018 Governor Ige released his “Intent to Veto” list. Included was SB2992, which would have weakened campaign finance disclosure laws. If enacted, signs and banners, in support or opposition of a candidate, would no longer be required to have the “paid for by” disclaimer on them. The public would no longer be able to identify the sources of these campaign materials without having to do additional research. We believe that in this post Citizens United world, coupled with the “fake news” phenomenon, it is more important than ever to identify sources of campaign materials, including signs and banners, and are glad this bill was vetoed. This year, legislators attempted to redact financial disclosures of powerful boards and commissions such as the Board of Land and Natural Resources and Public Utilities Commission, claiming that this would help fill vacancies. With your support, we strongly opposed, and while it came down to the wire, these bills were defeated (SB2609). For a full legislative recap, and specific bill information click here. We know that democracy works best when everyone participates, and everyone’s voice is heard. But legislators have regularly cut people out of conversations with deceptive practices like “gut and replace.” Gut and replace is when lawmakers wait until the last minute, then strip a bill of its original contents, stuff the bill with something completely different, and then push it through without the required public or legislative review. Because these terrible practices have been going on for years with no signs of stopping, we took the unprecedented step of suing the State of Hawaii to end the practice of gut and replace, and to ensure that everyone, especially our lawmakers, respect and abide by our State Constitution. Learn more about our complaint here. Civil Café. New for 2018, we held a panel discussion series in partnership with Honolulu Civil Beat throughout the legislative session. The panel included legislators and representatives from Common Cause and Civil Beat—discussing legislation and answering your questions. You can watch the recordings on our website. Protest to Protect Mueller. When President Trump dismissed Attorney General Jeff Sessions and appointed Matthew Whitaker as Acting Attorney General, hundreds of people across the state, along with thousands across the country mobilized within 24 hours to protect Robert Mueller’s investigation. Whittaker has frequently criticized the investigation and mused about cutting Mueller’s budget. The people spoke loudly and clearly—that we want and deserve an independent investigation to get the truth and accountability. Click here for a full list of list of Common Cause Hawaii events and community presentations. 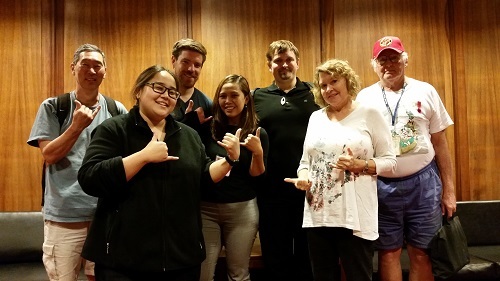 Because Hawaii has the lowest voter turnout in the nation, and does not have a Voter Guide, the Common Cause Hawaii Team worked to educate voters on 2018 issues. Hawaiipowerballot.com. This web-based application allows voters to input their address and then view their sample ballot. Voters can click on candidates to connect to their websites, social media pages, and candidate questionnaires. Voters can also find information on constitutional and charter amendment questions. CCHI volunteers researched and curated candidate information, and coders Jason Axelson, Royce Jones, and Aaron Fujimoto created and managed the application and website. This was the third election season that Hawaiipowerballot.com has been a community resource. Youth Voter Registration Project. In an effort to encourage more youth civic engagement, we have partnered with Kanu Hawaii and each school’s Service Learning Center, to pilot peer-to-peer voter registration programs at Kapiolani Community College and University of Hawaii at Manoa. The program trains student “civic ambassadors” how to register people to vote. The ambassadors work on their public speaking and persuasion skills when they “pitch” voter registration at campus events and class visits, and have those interested complete registration forms on the spot. 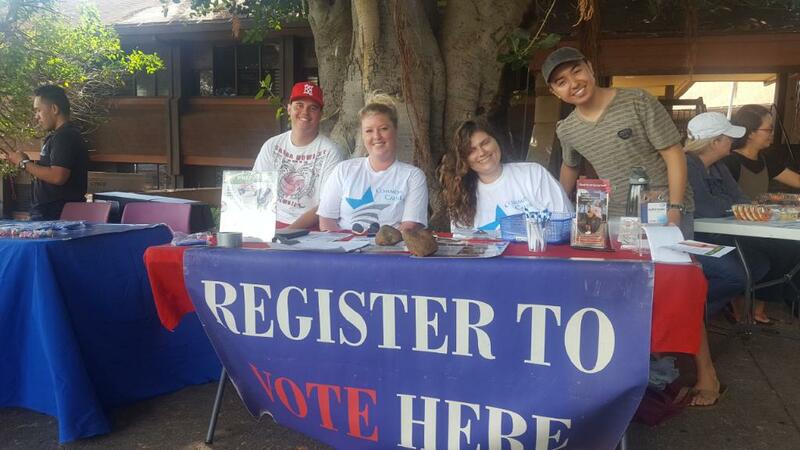 Students surpassed their goal and registered over 250 new voters during the semester and held a Get Out the Vote event at UH prior to the 2018 General Election. State Constitutional Convention—Citizen’s Jury. Every 10 years, the question of whether to hold a state constitutional convention appears on the November ballot. To educate the public about this question, CCHI, in partnership with the University of Hawaii Public Policy Center, Accord3.0 Network, William S. Richardson School of Law, and the Collaborative Leaders Network, sponsored a “Citizens Jury.” This was the first project of its kind done in Hawaii. We will continue exploring new avenues to reach voters and share information. Election Day Volunteers. A huge THANK YOU to our members across the state who helped staff polling sites across the state and at Oahu’s Control Center!!! Thanks to you, elections in Hawaii ran smoothly, with only minor technical glitches, and voters were able to make their voices heard. Who could’ve predicted everything that happened in 2017? But no matter the uncertainty, we knew we could count on your support in our fight for good government. Mahalo! Please enjoy this look at OUR victories and successes in 2017. Campaign Finance. 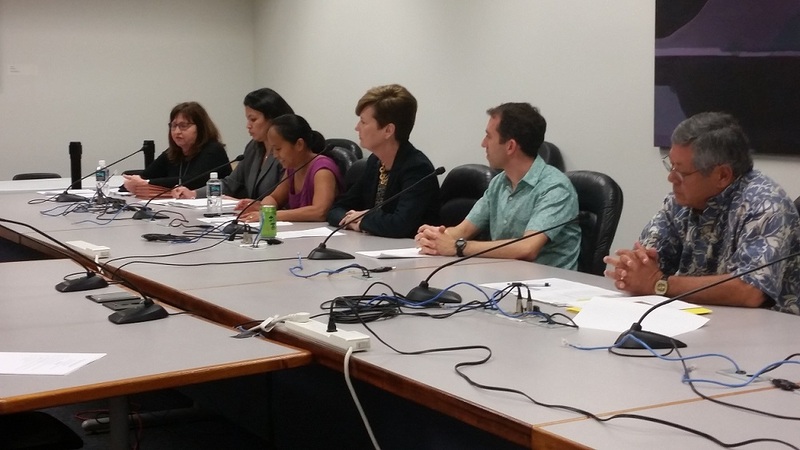 Bills were passed that brought much needed updates to Hawaii’s campaign finance laws. Changes include increased fines and closed reporting loopholes. Additionally, the Campaign Spending Commission’s general expenses are now funded by the general fund, and not the Hawaii Election Campaign Fund (HECF). The HECF is the trust fund that provides matching funds for Hawaii’s Publicly Funded (aka Citizen Owned) elections. This ensures the continuation of our program, a viable alternative to big money in politics. Transparency. Common Cause Hawaii is proud to have had a hand in the passage of the first major update to Hawaii’s Sunshine a.k.a. “Open Meetings” law in 20 years. HB165 (Act 64) updates included electronic notices and public access to board packets, which brings the law into the 21st century. Voting and Elections. For the past several years, we have been supporting voting modernization reforms like Vote by Mail and Automatic Voter Registration. Both reforms have been shown to increase voter turnout in states across the country. Unfortunately, both measures did not survive. Vote by Mail got the farthest, dying just minutes before the bill cutoff deadline. With increased awareness and your support, we’ll keep working to make it easier to vote. More updates to come soon. Ethics. Common Cause Hawaii worked with the State Ethics Commission to support necessary updates to clarify Hawaii’s lobbyist laws, and to strengthen the state Ethics Code. These bills close loopholes, increase fines, and are long overdue. Fair Courts. Together with the State Judiciary and members of the legal community, Common Cause Hawaii members and supporters worked to defeat bills that attacked Hawaii’s fair and impartial courts. Bills defeated included calls to cut retirement benefits for judges (and only judges), and politicizing the position of judges and justices by requiring Senate confirmation when renewing judges’ and justices’ terms of office. Find recordings and photos here. For more frequent event updates, like us on Facebook. Civil Café: Legislative Session—What Can I Do? We partnered with local newspaper Honolulu Civil Beat to present “Civil Café: Legislative Session—What Can I Do?” Bringing together long-time activists and political “newbies,” the panel discussion reviewed the legislative process, provided tips on how to get involved, and discussed various legislative proposals. Tax Day March and Rally. Common Cause Hawaii partnered with Hawaii J20 and hundreds of people across Oahu to demand that President Trump release his tax returns. The public deserves to know if there are conflicts and potential conflicts between Trump’s responsibilities as president to serve the public interest and his personal interest in his businesses. Member Update Webinar. 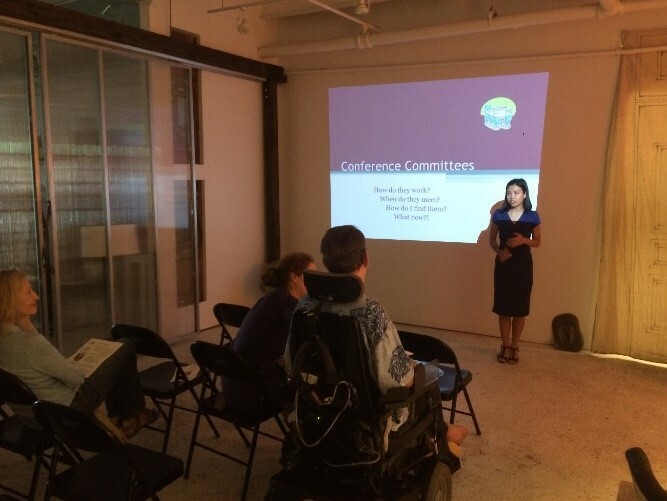 To better connect with our members across the state, Common Cause Hawaii held our first member webinar. Topics covered included a review of legislative successes, future plans, and challenges we foresee coming our way. Members were then able to question the executive director and board chair. Youth Voter Registration Project. In an effort to encourage more youth civic engagement, we are teaming with Kanu Hawaii to meet with students and pilot peer-to-peer voter registration programs at Kapiolani Community College and the University of Hawaii at Manoa. Ethics in Government: Theory or Practice. In today’s unpredictable political climate, ethics in government and the people’s confidence in government are facing unprecedented challenges. We hosted a panel discussion to delve deeper into this important, but often overlooked issue. Thanks to your support, Common Cause Hawaii was able to successfully advocate for good government reforms and reach more people than ever. Continue reading for a summary of Common Cause Hawaii’s 2016 highlights and accomplishments. would have undermined the Ethics Commission by exempting state employees from portions of the state ethics laws. Public House was a panel discussion series that mingled politics and humor in a “pau hana” atmosphere. Special guest panelists and video clips highlighted issues facing Hawaii. The public was encouraged to join the conversation and share their opinions. Issues discussed include: the State Legislature, education, mental health and the homeless, the new economy, and urban development. Click here for event recaps and photos. Dining for Democracy Fundraiser – Guests enjoyed a four-course menu prepared by the award-winning chefs of The Pig and The Lady while listening to keynote speaker Ian Lind, an investigative blogger and former Common Cause Hawaii director, who spoke to the evolution of ethics, lobbying, and citizen engagement in Hawaii. Stopping Honolulu Charter Amendment #19. The Honolulu Charter Commission is an appointed board which meets every ten years to study and review City government operations in the City Charter, the “Constitution” of the City and County of Honolulu. After months of meetings and hearings, the Commission approved 20 proposals that were on the general election ballot. If approved, Amendment #19 would have eliminated a provision in the Charter that helps to ensure bi-partisanship when redistricting at the county level. Thanks to an awareness campaign, and members educating their networks about the dangers of approving the amendment, 56% of voters said “No” to Amendment #19. It was one of only 4 amendments rejected by the voters. Saving our Partial Public Financing Program. 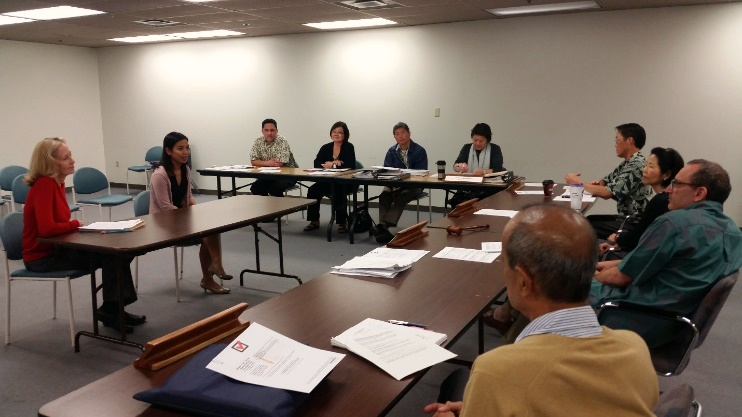 Common Cause Hawaii once again partnered with the Hawaii State Campaign Spending Commission (CSC) to increase public awareness and understanding about the Hawaii Elections Campaign Fund (HECF) and to increase contributions to the fund. Without an increase in contributions, current projections show the HECF in danger of being depleted by 2019. The HECF was established to fund the Partial Public Financing Program in Hawaii. The HECF also is used to support the Campaign Spending Commission and their work monitoring and enforcing campaign finance laws. The HECF is funded by Hawaii taxpayers who select the “yes” option on their state tax return to allocate $3 from the general fund to the HECF. Thanks to your support, contributions to the fund have increased, but the fund is still far from replenished. Our focus for the 2016 election was to ensure that our elections ran smoothly and that voters had the access to the information they needed when casting their ballots. Power Ballot. Back by popular demand, Common Cause Hawaii teamed up with local developers to create a website that allowed voters to easily find information, candidates, and ballot initiatives. The “Power Ballot” was a complete list of candidates and issues that appeared on the general election ballot. It contained links to candidate bios, interviews, campaign data, resources and helpful information on proposed amendments and issues. Who Will Fight Big Money? Voters deserve to know where candidates stand on democracy reform issues such as reducing barriers to voting, restoring the Voting Rights Act, etc. The Common Cause Hawaii Team, including volunteers, staff, and interns, reached out to all candidates running to represent Hawaii in Congress during both the Primary and General Elections to get them on record. Election Day Volunteers. More than two dozen Common Cause members and supporters volunteered their time and energy to help ensure our elections ran smoothly. We helped the Office of Elections recruit precinct workers and Control Center Operators, assisting hundreds of citizens to cast their ballots and make their voices heard. Photo (L to R): Randall Imada, Corie Tanida, Liam Tobin, Jamila Coronado, Garrett Thompson, Melinda Wood, and David “Tavita” Bohn at the Office of Elections’ Control Center on Election Day. Your support helped Common Cause Hawaii have another fruitful year. Read on to learn about Common Cause Hawaii’s 2015 highlights and accomplishments. Killed senators’ attempts to repeal Late Voter Registration/Same Day Voter Registration. Passage of SB996 (Act 151), which modernizes the State Ethics. Commission’s database so all reports filed with the Commission are more easily accessible to the public. Passage of SB508 (Act 079), which creates an additional filing deadline for super PACs, thus making super PAC campaign spending more transparent. Common Cause Hawaii volunteer Christine Trecker (L) and Executive Director Carmille Lim (R) kicked off the campaign at a Hawaii Campaign Spending Commission meeting. “Mark Yes” to support the Hawaii Election Campaign Fund (HECF) Awareness Campaign— Common Cause Hawaii partnered with the Hawaii State Campaign Spending Commission to increase awareness and understanding about the HECF, and to increase allocations to the fund. Without an increase in financial support, current projections show the HECF in danger of being depleted by 2018. 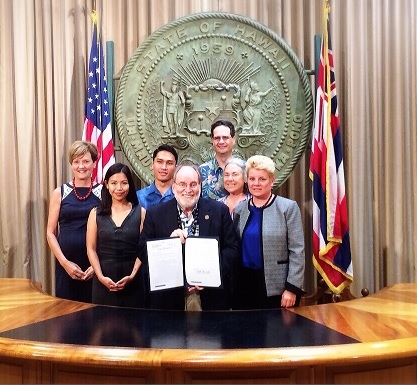 The HECF was established to fund the partial public financing program in Hawaii. The HECF is also used to support the Campaign Spending Commission and their work monitoring and enforcing campaign finance laws. The HECF is funded by Hawaii taxpayers who select the “yes” option on their state tax return, allocating $3 from the general fund to the HECF. These “yes” checkoffs do not affect an individual’s tax returns. There has been a steady decline in the number of people who select “yes” each year. The “Mark Yes” Campaign aims to increase the number of people who select “yes” on their tax returns thereby increasing income to the HECF. The campaign started in early January 2015 and continued through April 15, 2015 (Tax Day). Efforts included reaching out and educating the public as well as tax preparers across the state through traditional and social media, as well as direct contact. 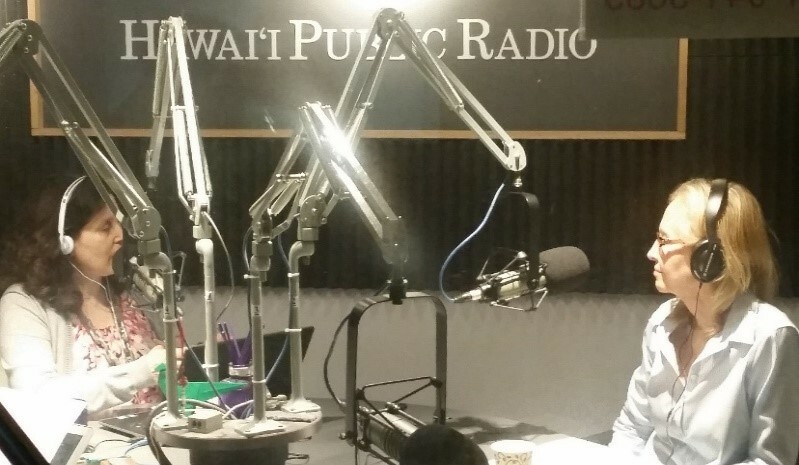 As Tax Day approached, Common Cause Hawaii was able to capitalize on the media’s and public’s interest, resulting in an interview on Hawaii Public Radio and Op-Ed piece in the Star Advertiser, Hawaii’s largest newspaper. Mahalo to Christine Trecker’s leadership on this campaign. Overturn Citizens United– Common Cause Hawaii supports overturning Citizens United, the Supreme Court decision that permits unlimited spending by super PACs. 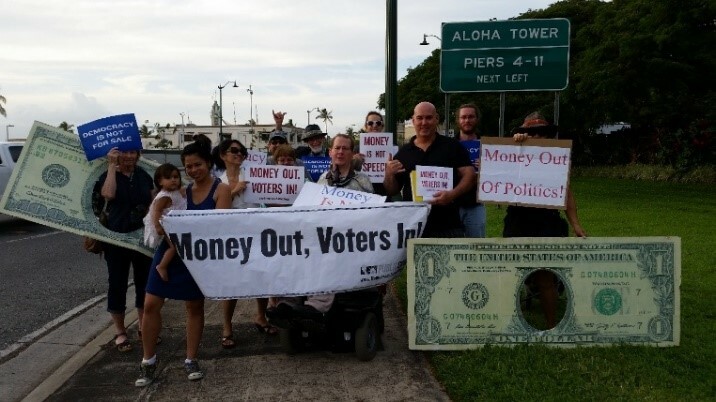 In response, the Hawaii State Legislature, Hawaii County Council, and Honolulu County Council each passed resolutions urging Congress to amend the U.S. Constitution and reverse Citizens United. 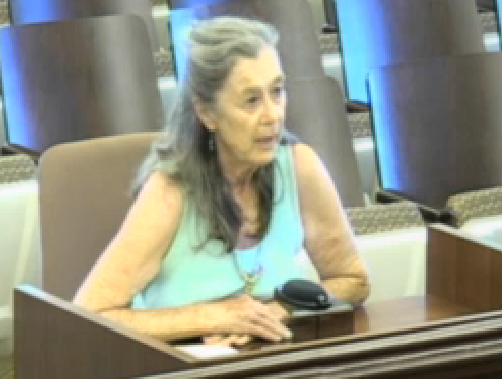 Sandy Herndon, lead organizer and Common Cause Hawaii supporter testified in front of the Kauai County Council in support of a resolution to overturn Citizens United. In 2015, thanks to the efforts of Common Cause Hawaii supporters and volunteers, the Kauai County Council and Maui County Council passed similar resolutions and are now on record supporting the reversal this horrendous Supreme Court decision. These resolutions will hasten the day when corporations stop buying elections in Hawaii, and across America. These successes on Maui and Kauai could not have been possible without the leadership of neighbor island organizers Sandy Herndon and Arianna Feinberg. To view the resolutions and learn more about our work on Kauai and Maui, click here. Are County Board of Ethics Members Funding Their Mayors? This report analyzed campaign contributions by county board of ethics members to their respective mayors, to determine if there is a correlation between contributions made and appointments to counties’ Board of Ethics. Click here to read the report. Common Cause Hawaii conducted an “audit” of Hawaii State boards, commissions, and agencies, in order to determine how they are interpreting and complying with Hawaii’s Sunshine or Open Meetings Law. Click here to read the report. Is the Hawaii State Ethics Commission Rewriting the Ethics Code? An analysis of Hawaii House Speaker Representative Joe Souki’s claims and complaints and recent Hawaii State Ethics Commission policies, to determine if the current commission’s administration is trying to rewrite the Ethics Code. Click here to read the report. Common Cause Hawaii identifies the “Top 5 Donors” for each 2015 Hawaii State Legislator based on campaign finance data from the Hawaii Campaign Spending Commission. Click here to read the report. Unhappy Unbirthday to Citizens United: Screening of Pay 2 Play-Common Cause Hawaii hosted a film screening of the documentary film “Pay 2 Play” on the 5th anniversary of the Supreme Court’s Citizens United v. FEC decision. The event’s theme was “Unhappy Unbirthday” inspired by the “Merry Unbirthday” scene from Alice In Wonderland. “Pay 2 Play: follows film maker John Ennis’ quest to find a way out from under the Pay 2 Play System, in which politicians reward their donors with even larger sums from the public treasury‒through contracts, tax cuts, and deregulation. Hawaii Open Budget: Budget Director Paul Harleman (L) and House Minority Leader Representative Beth Fukumoto (R) answer audience questions. Common Cause Hawaii and Public Citizen volunteers at the rally. President Obama to issue an Executive Order, requiring federal government contractors to disclose their political contributions to dark money groups. Held on the first anniversary of the McCutcheon U.S. Supreme Court ruling that further put our democracy up for sale, the rally was part of a nationwide effort in support of an executive order. 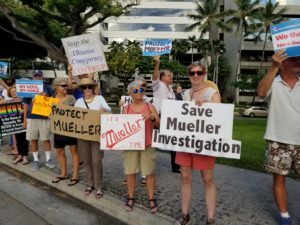 Participants stamped money, distributed flyers, waved signs, and visited the offices of Congressman Mark Takai and Congresswoman Tulsi Gabbard to encourage them to help “get money out of politics”. Advocacy 201 Workshop: Conference Committees-This workshop aimed to help attendees understand the role of Conference Committees in the legislative process, and how to understand Conference Committee rules. The Conference Committee workshop was done in partnership with the Public Access Room, featuring guest presenter Virginia Beck, Public Access Room Coordinator. Conference Committees Workshop: Common Cause Hawaii Executive Director Carmille Lim explains the role Conference Committees play during the legislative process. To stay up-to-date with Common Cause Hawaii news and events, click here to sign up for email updates. Mahalo for your support! SB2682 (Act 230) – “Public Financial Disclosures” This would require making public financial disclosure filings from certain boards and commissions that exert a high level of authority. Some of those that would be affected are: University of Hawaii Board of Regents, Hawaii Community Development Authority (HCDA), Public Utilities Commission (PUC), Board of Land and Natural Resources (BLNR), Land Use Commission (LUC). Partnered with Hawaii Open Data to host Civic*Celerator – a contest project aimed at developing user friendly digital applications (apps) leveraging the resource of open data made available by the Hawaii Campaign Spending Commission. Launched the People’s Pledge and Flag that Ad campaigns during general election season, in order to raise awareness and encourage community engagement around money-in-politics issues. These campaigns led to extensive media coverage of the influx of special interest money and independent expenditures (i.e., Super PAC money) in Hawaii elections. Expanded our network! We cosponsored public events and workshops throughout the year with groups like: Faith Action for Community Equity, Hawaii Appleseed for Law and Economic Justice, Hawaii Alliance of Nonprofit Organizations, Hawaii People’s Fund, Local 5, Grassroot Institute, Hawaii Open Data, Interisland Terminal, Start Up Weekend Honolulu, The BoxJelly Coworking (space), Media Council Hawaii. Among the events CCHI hosted was a screening of Inequality for All with an unprecedented group of co-partners (Hawaii Appleseed Law Center for Economic Justice, Faith Action for Community Equity (FACE), Unite Here Local 5, Hawaii People’s Fund) whose focus is on economic development, social justice, faith groups, and labor rights. The film connected-the-dots between income inequality and policy decisions made as a result of money’s influence in politics. Part of the event included a discussion on Hawaii’s minimum wage and how money-in-politics affects social, and economic issues. Nearly 300 people attended – the largest attendance of any CCHI event to date. Rechung Fujihira: is a Co-Founder of BoxJelly, Hawaii’s first co-working space. He is also a Co-Founder of Blue Startups, Hawaii’s first venture-accelerator and has helped to build various other parts of the Startup Ecosystem. Rich Halverson: teaches information technology management courses at the University of Hawaii at Manoa and Kapiolani Community College. He is also president of Guide.Net, Inc., an Internet software company developing Internet database applications since 1996. Brodie Lockard: is passionate about the environment, campaign finance, and achieving tangible results. He has worked closely with the Sierra club, Public Citizen, MoveOn.org, Organizing For Action, Move to Amend and Voter Owned Hawaii. Ben Trevino: is president of Bikeshare Hawaii, and is an experienced entrepreneur and technologist. He was a founder of Interisland Terminal, a Honolulu-based non-profit organization with projects including community spaces, the Kaka’ako Agora, and R&D Bookstore and Cafe. Inspired a dozen people to join as active volunteers. Among them were 5 young professionals. Reached 100% board participation in annual giving. Received a $5,000 grant award from Hawaii People’s Fund to support our organization’s work on systemic democracy issues. CCHI was a recipient of Hawaii People’s Fund grants in 2012 and 2013. Received a $20,000 grant from Piper Fund to support our efforts to build broad-based public support for publicly-funded elections. Look back at all our 2014 media highlights. Act 125, requiring legislators to file financial disclosure reports in January before legislative session to show potential conflicts of interest. Supported efforts to pass Act 263, which makes electronic data sets available to the public, and requires the chief information officer to develop policies and procedures to implement the open data initiative. The passage of this bill sets the foundation for future transparency initiatives focused on making campaign spending data more accessible to the public. Held community roundtable events geared toward young professionals and young advocates (ages 21-40), including one that focused on key federal campaign finance laws from the past 100 years. The event highlighted the 2010 U.S. Supreme Court decision that gave special interests first amendment protections (thus allowing corporations and unions to spend an unlimited amount of money in elections), and also had a briefing on the McCutcheon v. FEC decision currently before the U.S. Supreme Court – which has the potential to remove the cap on aggregate contributions to federal elections within a 2-year cycle. Hosted a screening and moderated discussion of “ALEC,” a film that exposes America’s most influential corporate-funded political force – the American Legislative Exchange Council. Secured a grant of $52,000 from Voqal USA to support a campaign to encourage interested members of the public develop mobile apps that will enable individuals to learn about candidates, see ways money is tied to influence, and make informed voting decisions. We are partnering with Hawaii Open Data on this project to promote access and usage of campaign finance data, which is available online but not broadly used by the general public, especially young people. Collaborated with Campaign Spending Commission to solicit and provide community feedback that helped to re-design their website, searchable database, and new application which presents candidate committee campaign spending data in “visual-data” format. Coached 45 high school students on money-in-politics issues, culminating in the students’ designing a money-in-politics info-graphic and presenting their design. By learning the abstract money-in-politics issue at an early age, students are able to understand and communicate to their peers how money alters the dynamics in political campaigning and law-making. #2 Reduce barriers to political participation by modernizing voter registration and opening up other avenues for citizen involvement. Advocated for two voter reform bills that moved to Conference Committee, the furthest any similar measure has progressed (Publicly Funded Elections and Same Day Voter Registration). Advocated for successful enactment of the Online Voter Registration bill, which we helped pass in 2012. We have continued to meet with the Office of Elections to ensure that progress is being made on developing the new system, which must be in place by 2016. Collaborated with the League of Women Voters of Hawaii and Office of Elections to address concerns about the lack of public education on ballot measure issues. As a result of these meetings, Common Cause Hawaii will be supporting efforts to raise public awareness for how citizens can access such information. Focused several community presentations on voting modernization and same day voter registration. Held advocacy training workshops for college students who are not political science majors. For example, Common Cause Hawaii hosted an advocacy training for 51 senior nursing students. The training included “How A Bill Becomes A Law”, “Advocacy 101 Tips” and featured the Senate Health Committee Chair as guest speaker. With this different approach, we helped tie democracy issues and advocacy with an issue relevant to the students and their desired career-path– healthcare. #3 Fight back against attacks on our ethics and transparency laws. Took the lead in addressing ways to improve ethics, transparency, and public access in the legislative process via the legislative rules that govern our Legislature, and continue to hold our legislature accountable for their actions. Issued a letter, which was co-signed by 13 other nonprofits, and 300+ citizens to the Senate President and House Speaker to address ethics issues and offer solutions. Worked with the League of Women Voters of Hawaii to track instances of gut-and-replace, late hearing notice postings, hearing notice waivers and requests for rulings on Conflicts of Interest. Brought to light to a Senate attempt to include unrelated language in a bill, without giving public notice. We mobilized the public and the media to hold the Senate accountable. In this process, we educated the public about the deceiving “gut and replace” and “Frankenstein” practices (by which legislators severely alter the contents of the bill without public knowledge). In response to our efforts, the Senate allowed for more time for public input on this bill. A combination of community organizing and successful media campaign resulted in Common Cause Hawaii’s successfully addressing deceitful legislative practices, resulting in at least 11 of the 18 “bad bills” dying in the final days of legislative session. Common Cause Hawaii became a resource for the public during special session: we helped answer questions from community members related to how special session works. In response to several concerns about access, ethics, and transparency during special session, we developed and placed an OpEd in the state newspaper which addressed access issues and dispelled false claims about how “unconstitutional” some of the legislative actions were. Held several workshops and events primarily focused on how ethics and transparency in government affect the ability for public input in the legislative process, and ways we can improve this. 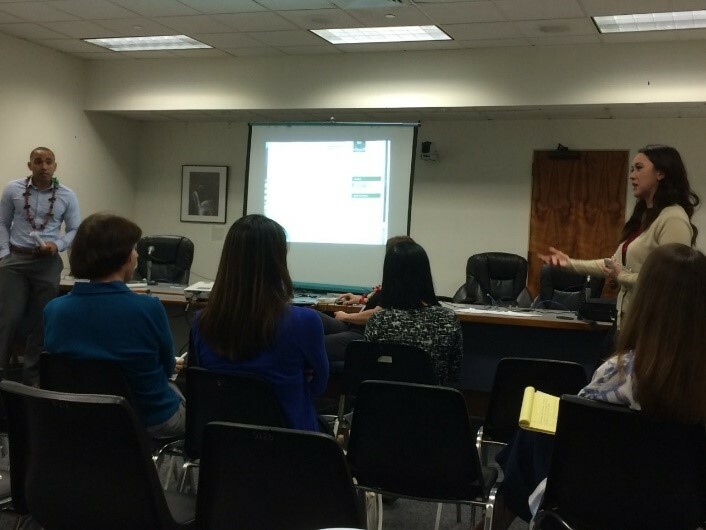 Co-sponsored a workshop with the Hawaii Ethics Commission, Hawaii Campaign Spending Commission, League of Women Voters of Hawaii, and Kanu Hawaii which focused on recruiting new commissioners for the respective commissions. The workshop resulted in seven applications to the Ethics Commission and two applications to Campaign Spending Commission. We continued mentoring interns and young professional volunteers into 2013. 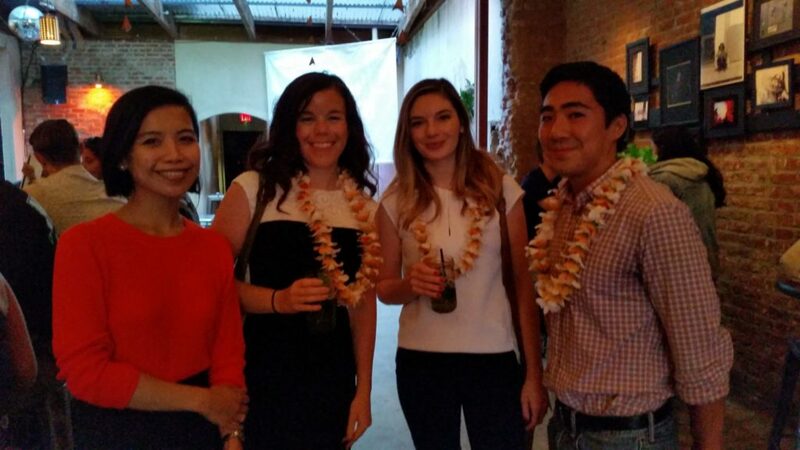 Our interns wrote policy briefs and blog posts, press releases, produced white papers, and held a “wheel-of-fortune” like game at YELP Hawaii’s “Good Karma Ball” Halloween party, which had over 1,000 young professionals in attendance. Two interns created a new student club that promotes political awareness and participation at the college. Several interns moved on to session jobs at the State Legislature. In addition to policy and outreach work, Common Cause staff provided nonprofit management training for interns. Nikki Love, Public Policy Director for the Hawaii Alliance of Nonprofit Organizations. She previously served as Executive Director of Common Cause Hawaii and helped lead the chapter’s rebuilding process, which began in 2007. Nikki has worked for the Hawaii State Legislature, City & County of Honolulu, and other nonprofit organizations. Burt Lum, Executive Director of Hawaii Open Data, a non-profit dedicated to advancing the principles of open data. Burt has more than 30 years in Hawaii’s technology and communications sector. Note: Burt has since taken a leave of absence so that Common Cause Hawaii can pursue the Voqal grant. Jared Kuriowa, Senior Programmer for Oceanic Time Warner Cable’s Interactive TV. His background includes management of a small programming department, extensive broadcast technology experience, and as the application development lead for a leading payroll outsourcing company. Common Cause Hawaii brought on five new young professionals as active volunteers to work on campaigns and activities that raise awareness for money-in-politics and ethics and transparency at the legislature. Was granted a $5,000 grant award from Hawaii People’s Fund to support our organization’s work on systemic democracy issues. Was granted a $52,000 grant award from Voqal to hold a campaign which will encourage interested members of the public develop mobile apps that will enable individuals to learn about candidates, see ways money is tied to influence, and make informed voting decisions. Re-engaged six donors who had not been active in five, 10, and 20 years. Successfully advocated for a bill to modernize voter registration by establishing an online voter registration system by 2016. Successfully advocated for two state legislature resolutions and one county-level resolution to fight back against Citizens United v. FEC. These resolutions requested Congress put forward constitutional amendments to address campaign spending and corporate personhood. Launched “Rotunda Roundups,” an informal weekly gathering in the State Capitol rotunda to help citizens navigate the legislative process. Every Thursday at 5:30 p.m. during the 2011 Legislative Session, we welcomed crowds of 15-50 citizens to review the legislative calendar, discuss how citizens can take action, provided updates on important bills, and talked with legislators and activists. Was at the forefront of ethics issues in the 2011 Legislative Session. State legislators proposed major loopholes in Hawaii’s ethics law that would have allowed legislators and state employees to accept lavish gifts from special interests. Common Cause Hawaii testified against the proposal, mobilized citizen opposition, and spoke out in the media, and the bill was ultimately blocked in committee. Helped stop a bill in the state legislature that would have rolled back the existing “pay to play” restrictions that would have allowed government contractors to donate to political candidates. Partnered with local organizations to engage citizens in the electoral process, and recruited more than 200 volunteers to work at the polls. Many of these poll workers were students and young people who participated in the political process for the first time. Pulled together 18 diverse organizations to promote transparency at the state legislature. Together, we advocated for increased webcasting of hearings, more public notice for meetings, and improved online access to legislative documents. Led a coalition to “stop the tsunami” of special interest money in politics. Common Cause Hawaii blocked a number of bad bills that would have increased corporate campaign donations, allowed political donations from government contractors, and increased campaign funds raised outside the state.